'Complex And Difficult Days' Without Chavez, Venezuelan Vice President Warns : The Two-Way The Venezuelan president is recovering in Cuba after an operation on Tuesday targeted an aggressive cancer. It was his fourth cancer-related surgery in Cuba, and comes after he won re-election last month. 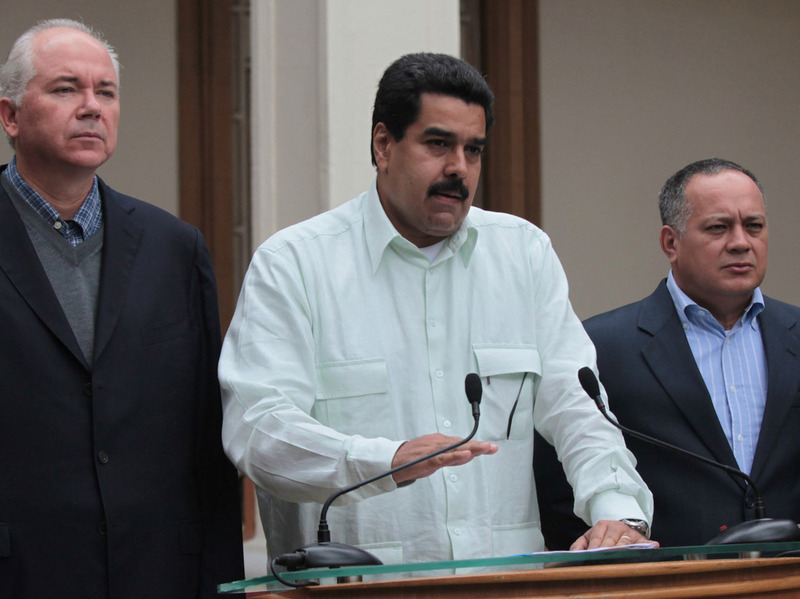 Venezuelan Vice President Nicolas Maduro, center, addresses the nation flanked by Oil Minister Rafael Ramirez, left, and National Assembly President Diosdado Cabello at the Miraflores presidential palace in Caracas, Venezuela, on Wednesday. Venezuelans must prepare for "complex and difficult days" after President Hugo Chavez' cancer surgery, the country's vice president says. "He was very clear in his request that the people back him and keep him in his thoughts as he undergoes treatment, and also that our people be serenely prepared to face these hard, complex and difficult days that we're going to live through. ... This can only be achieved if the country remains united," Vice Presidnet Nicolas Maduro said, looking grim as he appeared on national television. Chavez is recovering in Cuba after an operation on Tuesday targeted an aggressive cancer. It was his fourth cancer-related surgery in Cuba, and comes after he won re-election last month. Chavez' inauguration is set for Jan. 10, but The Associated Press reports that Information Minister Ernesto Villegas said if the president doesn't return in time for the ceremony, "our people should be prepared to understand it." Over the weekend, Chavez announced that he needed surgery again, tapping Maduro as his successor. News reports say malignant cells reappeared in the same part of the pelvic region where Chavez previously had tumors removed. "Chavez first announced he had been diagnosed with cancer in June 2011. He underwent a surgery for a pelvic abscess, and then had a baseball-sized tumor removed. In February, he underwent another surgery when a tumor reappeared in the same area. He has also undergone months of chemotherapy and radiation treatments. Throughout his treatments in Cuba, Chavez has kept secret some details of his illness, including the exact location and type of the tumors." The BBC reports that Ecuadoran President Rafael Correa, a Chavez ally who flew to Havana to be with the Venezuelan leader, said the operation had been "very delicate."